PowerBuilder 2017 R2 added a number of REST features, which I covered in a previous blog post. One area for improvement on the original feature was better support for REST authentication methods. The HTTPClient and RESTClient objects provided methods to set request headers, but doing the legwork needed for some of the more complex authentication mechanism (i.e., OAuth) were left to the developer. PowerBuilder 2017 R3 addresses that. In this blog post we'll look at using this new feature. 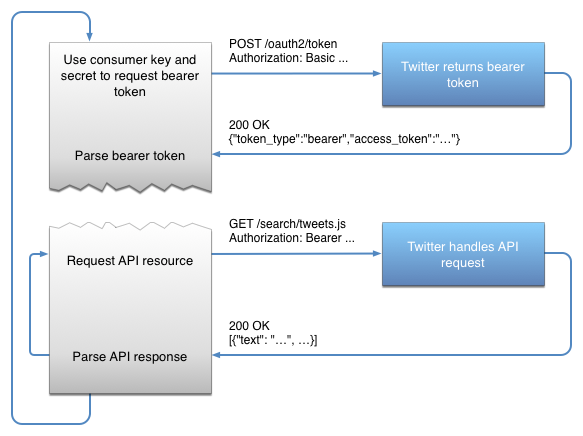 We're going to look using this new object to do a specific OAuth operation, searching for tweets on Twitter. To do that, the first thing I'm going to do is go to https://apps.twitter.com/ and create an application for my account. For this particular demonstration, I'm only going it allow this application to have read permissions, and I'm going to use what Twitter calls application-only authentication. You can also create applications that do things on their own behalf, not representing a user. That's what we're going to do. On the Key and Access Tokens tab on this page you'll find the Consumer ID and Consumer Secret that we're going to use to authenticate to Twitter on behalf of the app. The process flow is fairly simple. Our application is going to use the Consumer ID and Consumer Secret as user name and password and perform a Basic Authentication to the Twitter OAuth token service. In Basic Authentication the user name and password are combined with a colon between them. That value is then Base64 encoded and included in an Authorization header in the request with the word Basic in front of it. 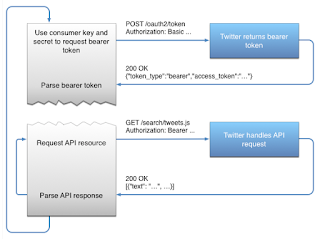 Assuming the authentication works, Twitter passes back an OAuth token. The application then makes the request for the resources it wants, this time passing the token with the word "Bearer" in front of it in the Authorization header. Note that once the application has a token, it can use it for numerous requests, up until the time the token expires. When the token is returned from that OAuth service, one of the pieces of information that is passed back with it is when the token will expire. The length of time varies depending on whose services you're using, but as of this writing however, Twitter does not expire tokens at all. Note that I didn't really need to provide the secureprotocol or timeout properties on the OAuthClient object here. I included them just to show they were available and set them to their default values. Timeout is in seconds and you can set it to 0 for an infinite timeout. A 0 for SecureProtocol means the object will start with TLS 1.2 and then work down the list of SSL protocols until it finds the most secure one that is supported by the service it's connecting to. You simply set the ClientID and ClientSecret properties. We're also indicating, per the Twitter API docs,that the grant type we want is "client_credentials", that we're doing a POST request, and the particular URL that we're making the request to. The w_oath_credentials window that is being opened here just allows the user of the application to provide the appropriate credentials for the OAuth token request. They're returned back to the calling window on the click of the OK button. In this case we simply got a token, and the expires of 0 indicates that it doesn't expire. Once again, timeout and secure protocol are optional. The only thing we need to do is, per the Twitter API docs, indicate that the method is GET and provide the URL. We pass in the accessToken that we got in the token request and the OAuthClient sends that along on the request. And we have another window that shows everything that was returned from the ResourceRequest. PowerBuilder 2017 R3 provides an important improvement in REST web services support with the added support for OAuth. What I'd like to see in the future is support for JWT bearer tokens as well. However, with the encoding and encryption objects also added 2017 R3 which I'll be covering in a future blog post, it would be fairly easy now to put together those requests manually.